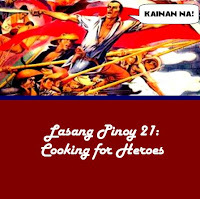 The 21st edition of Lasang Pinoy is brought to you by Bryan of Fire Water Husband (blog under renovation) who has this great idea of Cooking for Heroes. It's just as well that our current logo features the exact hero I want to cook for - Andres Bonifacio. Even in my elementary school days I feel our dear old Andy Boni got a raw deal. I do believe he should be our national hero for he started the Katipunan, he started the ball rolling to begin the revolution and break free from the colonial masters. And what did he get for all his heroism and troubles? He got salvaged (executed) for being a rival party in the election for the head honcho of the revolutionary government. Then he lost out again almost a hundred years later in being a national hero. If that's not a raw deal I don't know what is. It's no use arguing now about his place in history but what is undeniable is his courage, heroism, and his love of his country and fellow Filipinos. To you Andres, a big lambanog toast for being a real Pinoy! Thank you for all the things you have done for us. Soak the noodles in tepid water for about 20 minutes or until soft. Using scissors, cut into desired lengths. Drain and set aside. In a wok, heat 1 Tbsp of the oil in medium heat. Saute half of the garlic and half of the onions. Add the meat and stir fry a little. Season with salt and pepper. Add about 1/4 cup stock or water and simmer until done. You may have to add a bit more stock from time to time to keep it from drying out. When the meat is done, add the carrots, mangetout, and celery. Stir to combine. There should still be some liquid in the wok if not add about 2-3 Tbsp stock and then cook under cover for 2 minutes. Add the cabbage, stir fry for a few seconds and cook under cover for 1 minute. Remove from heat and transfer to a dish. Set aside. Using the same wok (no need to wash unless there's some burnt crust in the bottom), heat the remaining 2 Tbsp oil on medium heat. Saute the remaining garlic and onion until onion is translucent. Tip in the stock and any sauce drained from the meat and veg mixture. Add the soy sauce and season with black pepper. Bring to boil then add the noodles. Cover and bring to boil again then lower heat to medium-low. Once the sauce starts getting absorbed by the noodles (about 5 minutes), toss and stir the noodles (preferably with large forks for easier tossing) until all the sauce is absorbed and the noodles are fully cooked. The tossing also make sure that the strands are separated and do not clump together. Don't worry if the bottom is getting a bit crusty. At the end there should be no sauce left but the noodles should still be moist, cooked but not soggy. Add half of the meat/veg mixture and toss to mix. Dish up and transfer to a dish. Top with the rest of the meat/veg mixture. Serve with calamansi or lemon on the side. *Note: You may use precooked meat in which case add it in at the same time as the carrots and mangetout. I made this recipe (Pancit Bihon) for the first time for my husband's pot luck at work. I had no qualms in my belief in your recipes as I had made the Pork Chili Noodles before and it tasted good. I just want to thank you for writing such accurate and delicious recipes. I also enjoy your writing. Thank you for keeping me in touch w. my Filipino roots.